Freedom of Speech. It’s so interesting that the once most celebrated human right is now the most controversial one. Sometimes you just get appalled by the sheer stupidity that surrounds you that you don’t even have words to describe them. And this results in immense frustration and all you can do is infuriate yourself by observing what’s happening around. 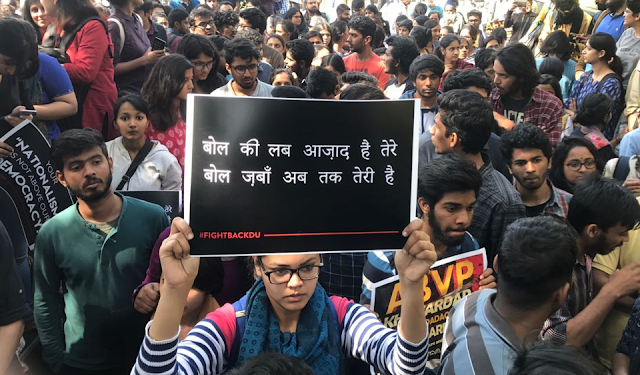 Most of our sentiments were hurt when AVBP goons took over the streets of Delhi University, and as protectors of Indian culture and nationalism, started exercising their masculinity by thrashing and molesting people. As if freedom of speech is conditional to ideas and views of what a group sitting at the pedestal believes in. If they don’t like what you are doing, they will make sure you are proved wrong and brought to justice by breaking every law possible. Morality of course has no place here. Oh! That sounds like the patriarchal and Brahmanical structure that India has been battling for a long time. As the ruckus unfolded within the streets of Delhi University, where a random girl walking her way to college was manhandled because some perverts calming to be from the hegemonic group took upon the chance to exercise their hooliganism over anyone visible. Our censor board hit a low blow by declining the film 'Lipstick Under My Burkha' a censor certificate. If you don’t know the reason, don’t ask it because just like what happened on the streets of North Campus, it makes no sense. Anyway, after all the Censor board and our student ambassadors of Indian nationalism and culture eat from the same plate. Just like it’s perfectly fine to certify and enjoy movies like Mastizadde and Great Grand Masti, it’s perfectly fine to stop a discussion of ‘Culture of Protest’ and beat the organizers because they are polluting the environment in a University campus. Just listen to this person. Must it be reiterated here that Freedom of Speech is a very celebrated right. In Assam, an aspiring young singer took this guaranteed constitutional provision to make a song which has infectious double meaning and vulgarity. I was just wondering if we had a student body which could protect our culture from being polluted by such nuisance in the name of art. But of course, they had better things to do, like stop an academic conference which had elements of constructive criticism. If you understand Assamese, you will probably find this debate on the song very interesting and amusing at the same time. And just to make it very clear again, all these events happened within a week. So, you see, there is so much happening around that you almost forgot that ISRO launched a record breaking 104 satellites into the space just a week back. So, in a week we reached the universe and within the next one week we stooped down to new low by bringing in violence into the university campuses. This must be a new record in itself. Our tolerance has decreased to such a level that today we prefer reading ‘News in Shorts’ but not a detailed article. So, even if I go on to rant on and on, this piece will just be like that constitutional right which is being talked upon here, in effective. What a time to be alive.